Seven years of silent treatment brings the young woman to the edge of despair. Her father, the illustrious Patron, has refused to speak to her since she was thirteen, and everyone in the village follows his rule. One day, the girl realizes her twentieth birthday has passed, and she is now the age when she would enter society as a Woman – if only she wasn't an outcast. Knowing her life will never get better, the girl decides to end the aching silence within her in the depths of a violent river. Just before plunging into the icy water, a voice behind her utters, “There is a better way.” The Sorcerer of the Caverns stands at the bank, holding a promise. He has the power to end her ostracism, but as the girl knows, a change of destiny this drastic must claim a fair price. The Patron found her past the wide bend in the river in the same spot where she and the Trainer used to fish. Crouched on her haunches, she wore crude trousers tied at her waist, the fine stitches of her blouse grimy, her hair in a long braid to her waist, strands tousled around her face. Although she’d grown taller and now had the curves of womanhood, she looked just as she had that season seven years ago. Scanning the trees, he almost expected to find the Trainer, but his daughter was alone. One thing had changed. She’d never worn a holster back then, but now had one belted below her waist. He raised his brows when he saw one of his pistols at her hip. He hadn’t heard the shot when she caught the squirrel, but she was skinning the carcass with one of his daggers. So intent was she on her task she didn’t hear him approach. Her eyes grew wide when she looked up and her hand slipped, the blade slicing into her wrist. The Patron leaped off his horse and reached her in two strides. Gripping her arm, he sunk her hand in the water. The girl resisted, but he held on tight and squeezed her wound to stop the blood flowing into the river. He brought her hand out of the icy water and pressed his scarf against the side of her wrist, pulling a handkerchief from his breast pocket. He heard her labored breathing and felt the taut muscles of her arm while tying the bandage around her wrist. The Patron glanced over, ashamed when he saw the girl pulling as far from him as possible, her eyes narrowed to slits. It had been years since he last touched her. Montgomery Mahaffey is a fantasy writer who has told her stories all over the country. 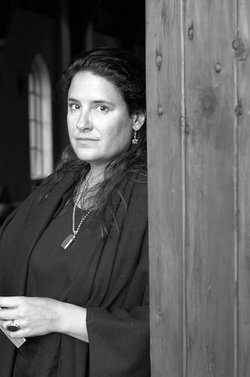 Alaskan winters shaped Mahaffey as a writer, and her work is built off of the myriad of personal and collective experiences formed underneath that mystical landscape. Born in the south to a family of storytellers, Mahaffey has developed her own voice that is suffused with the temperament of the wanderer instinct. Set in a world where magic is at once subtle and pervasive, her novels bring to life symbols and stories of the old fairy tales told with wry humor and passion. In 2005 she was granted the Individual Artist Project Award from the Rasmuson Foundation in Anchorage, Alaska. 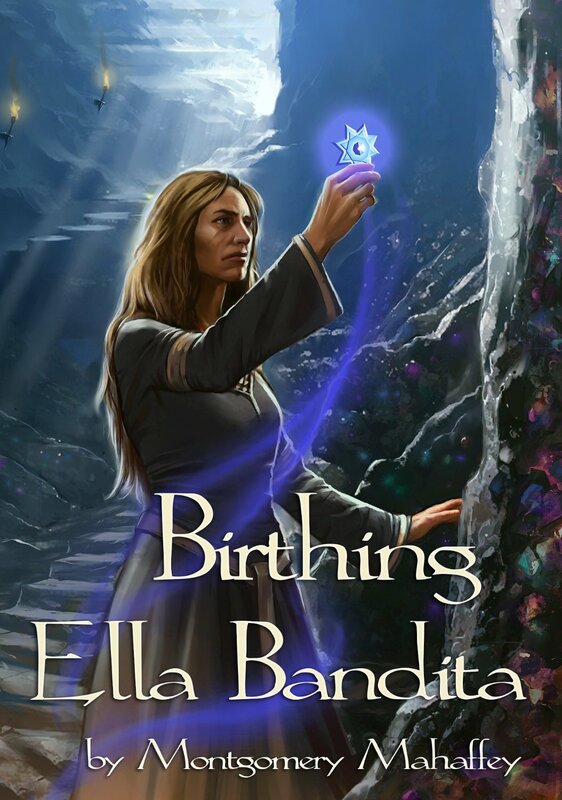 Ella Bandita and the Wanderer is her first novel. 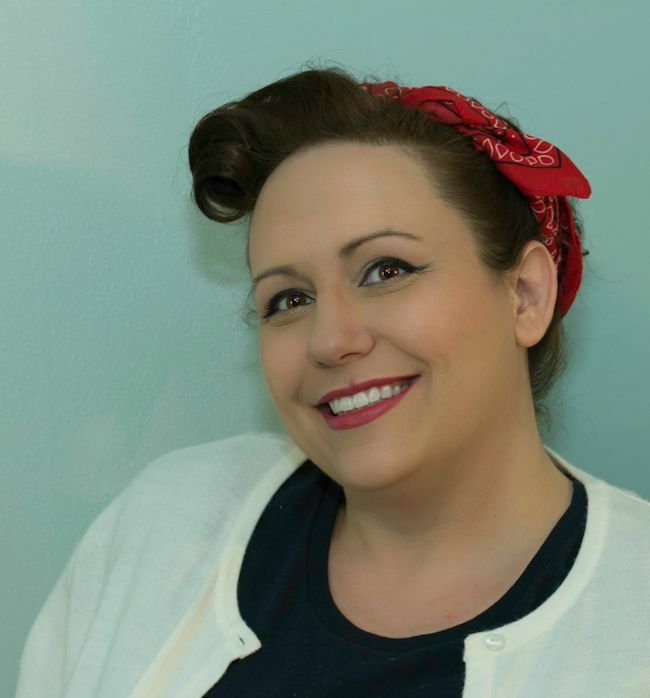 The last thing military widow Summer Bettes wants in her life is a new man. Correction, a new military man, though they're all over Barrum, Kansas. She’s convinced herself she works hard enough between taking care of her daughter, trying to maintain control of her asthma, and styling hair in the salon her mother owns that she doesn’t need to add a man into the mix. When Matthew Hennessey walks into her life--or rather, back into her life, she starts to question everything. Her husband's rival on the wrestling mat in high school, Hennessey never forgot Summer. She always held a special place in his heart. So after serving with her husband overseas, it was only right that he pay his respects to the widow when he came back state-side. He only wants to do right by her. Unfortunately his desires are eclipsing his logic, and doing right by Summer is harder than he thought. I’d been a hairdresser for over a decade--even when Jake and I moved from base to base, I could always find work, and it was the same sounds, no matter what salon I worked in. All the traveling made the familiar environment more home than anything I had for a long time. Stepping around the corner, my hand bumped the little patriotic flag table topper that sat on the edge of the reception desk. Mom put it there when I married Jake--it was the only patriotic decoration that remained up year round. Now, though, it had other accompanying red, white and blue pieces that filled the reception area, even though Fourth of July was last weekend. The receptionist, Mikelanne rubbed her ready to pop, pregnant tummy and gestured to the man who stared at the retail shelves near the door with a grin on her face. The guy was in fatigues. He turned around, and had his hat in his hand. Immediately my eyes darted to his shoulder, and recognized the stripes for Sergeant, First Class. I met the Sergeant’s eyes. I nodded. “Sergeant.” Somewhere my insides jumped into gear. I held out my hand, and he shook it. I blinked, then my brain kicked in. “Of course, thank you.” Why else would a man in fatigues be visiting me? USA Today and NY Times bestselling author Candice Gilmer leads a dangerous double life as a mommy and a writer. In between boo-boo healing and fixing broken toys, she writes stories usually to the tune of children's television shows. All in all, she stays very busy, but really, she wouldn't have it any other way. Well, maybe a little less children's television. Though Jerome "Jay" Isip now enjoys the success of being a professional MMA fighter, entrepreneur, and author, he is no stranger to the feelings of self-doubt, depression, and lack of direction that many people-- young and old, male and female-- struggle with at one point or another in life. This candid, autobiographical book tells of MMA fighter and accomplished champion Jerome Jay Isip's journey to find his identity and his own version of "happy" in early adulthood through self-destructive means like alcohol, a myriad of drugs, and other risky behavior, and how he pulled himself back from the edge of the abyss, finding the courage to live a life of clarity and purpose after discovering what true, lasting happiness in life is all about. Jerome "Jay" Isip is a successful entrepreneur within several walks of life - finance, small business, e-stock trading, and athletics. Born and raised in Belleville, New Jersey, Jay was never one for academics. Rather than concentrating on coursework, he was instead distracted by the typical trappings other young men endure. Jay has always been more interested in enjoying life and those around him, which isn't going to get anyone accepted at a credible college or university. Even still, through all the self-destructive means and risky roller coaster of behavior, Jay stayed determined to choose his own career path, which would eventually lead him to becoming a business owner, a professional "mixed-martial arts" fighter. And now he has added the title of "author" to the list. #1 Best seller in Holiday Romance Series! 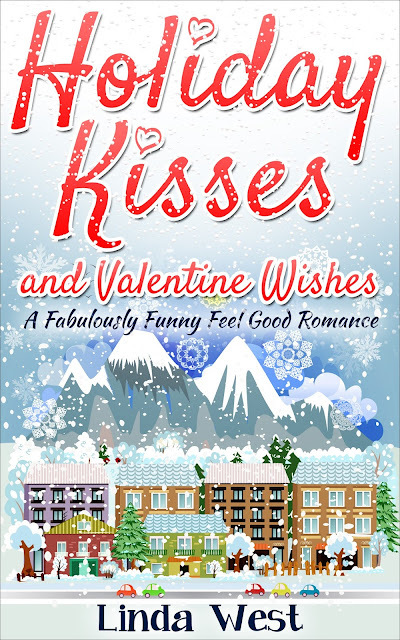 Best selling author Linda West follows up her best selling book "Christmas Kisses and Cookies" with her newest book "Holiday Kisses and Valentine Wishes!" Sure to warm your heart and feed your soul. This is an enchanting feel good book that is clean and wholesome and uplifting. Settle in with a cup of cocoa and a comfy chair and prepare to be delighted by this lovely tale. Summer and Brad are finally reunited and planning a life together in their hometown and all is well with the Landers' cookie legacy! Christmas was magical but wait till you see what happens when the Valentine Ball rolls around! The town's single girls are up to their arms in dough and drama as they compete for their beau's via baked goods. When a young widow recently jilted arrives in town it begins a whole new dynamic that no one was ready for. Another delightful charming tale of the sweet inhabitants of the holiday crazy town of Kissing Bridge Mountain. "This is a classic romance that is heartwarming, delightful and fun! It was so adorably and feel good it made me smile. I was such a fan of "Christmas Kisses and Cookies" that I couldn't wait for this follow up book! I was delighted to read more about Summer and Brad and loved the backdrop of another fun bake off to win your Valentine date. A super wonderful clean and uplifting book! 5****"
"I love the adorable world of Kissing Bridge Mountain! I wish I could live there! 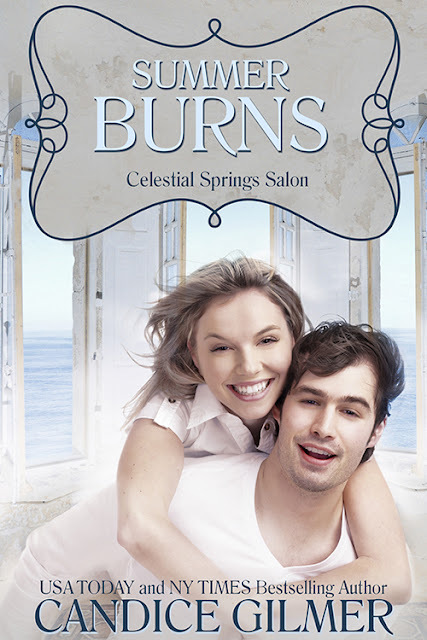 This is a mushy sweet enchanting and clean romance that leaves you happy and uplifted. I highly recommend it!" Lose that excess weight and keep it off for good—even with your hectic lifestyle! Executives face extraordinary stress and challenges to maintaining a healthy weight and lifestyle. Frequent travel, dinner meetings, and high pressure jobs combine to create a difficult environment, both outside and inside the body, for sustaining healthy habits. The methods outlined in The Busy Executive Diet are proven ways of building better eating habits for sustained health that happen to also slim your waistline and give you a more youthful appearance. Gabriella Kindert (MBA, MA) is a finance executive who has worked in numerous countries for leading organizations. Over the years, she has attributed her success to hard work, diligence, and dedication. In addition to her job, she is a founding partner of several successful companies. Despite her busy schedule, she is a mother of two children and a devoted wife. During her career she realised the importance of balance, nutrition, physical activity for better control of every aspect of life. She has established an organization called One Life, which actively promotes a healthier lifestyle. You can also follow her on Facebook.